Monster Party has three beginnings. That's a lot of starts for a film that's just 90 minutes long, but so be it. We first get a disconnected, yet very effective mood setter, then a character-establishing heist short, before diving into the main story, as a trio of young thieves--Casper (Sam Strike), Iris (Virginia Gardner) and Dodge (Brandon Micheal Hall, Search Party, The Mayor)--take on a gig as servers for a rich family's party in order to rob their mansion. The only problem for the three criminals is the guest list of the party, which is made up entirely of extremely dangerous psychopaths. Sure, writer/director Chris von Hoffman has delivered a ridiculous concept, but he's matched it with an over-the-top style that elevates the film to an entertaining level even before you include the solid cast. Combining a few film genres into a no-filter bit of bloody madness, you get a house full of blood-thirsty killers trying to eliminate a trio of thieves, who are locked in thanks to a heavy-duty security system. Though it takes a moment to get rolling, once the fuse is lit, the film delivers, even if it tries to pace out the craziness with moments of character-driven quiet. That's what you do when you have a cast that can carry a scene that butts up against a grisly murder. And with Robin Tunney (The Craft) and Julian McMahon (Nip/Tuck) as the husband and wife hosts and Lance Reddick (Fringe) as the man in charge of the gathering, this film has no shortage of acting talent that can maintain interest when blood isn't being splattered everywhere. It's an interesting idea to build film without a "hero", though Casper is given externally-provided motivation that brings him closest to that role. No one in the film is a good person, so you are left to choose your champion, whether you want to go with the lesser of two evils or the very evil, but very flawed bad guys who are struggling with their demons (though a class-warfare element to the proceedings may help sway you.) There's an argument to be made that everyone gets what they deserve, but if not for an inciting incident, this story goes a very different direction. Sure, some of the characters are reprehensible (namely the younger guests--raging cokeheads who objectify Iris at every turn) but there has to be some consideration for motivation. If only the film gave voice to such concerns. But that's not what Monster Party is about. What it is about is attempting to show you something new and different at every turn, whether through plot, action or cinematography. There is a moment in Monster Party that, though somewhat expected in the big picture, plays out in a way that literally made your reviewer's jaw drop. It happens so quickly that it will take a moment for it to register fully, but once it does, you may fight the desire to slowly applaud von Hoffman's sheer audacity at even considering committing it to the screen. Not everything attempted lands quite as well (there's a lot of gore that lacks cleverness or originality) but as a whole the film is an entertaining watch that's made with talent and verve, rising above the normal low-cost gore fest. Monster Party arrives on Blu-ray as a one-disc release, which is packaged in a standard-width Blu-ray keepcase, held in a slipcover that repeats the cover art. The disc has an animated menu with options to watch the film, select scenes, and adjust languages. There are no audio options, while subtitles are available in English, French and Spanish. 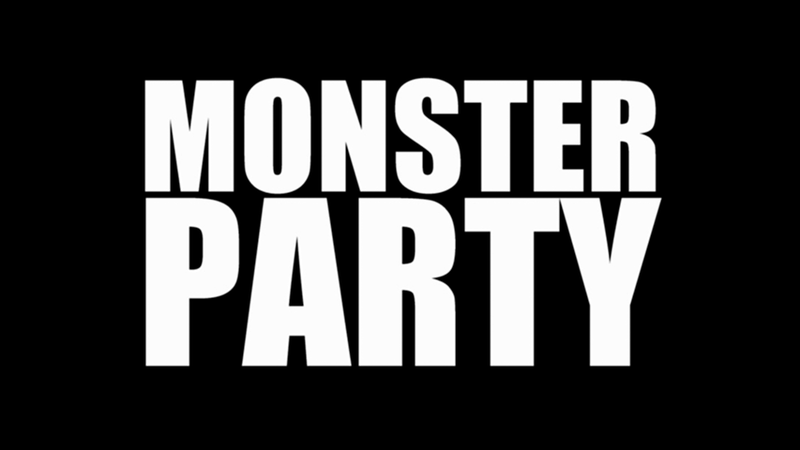 Monster Party is not a film of subtlety, and the DTS-HD MA 5.1 track on this disc brings the power needed to get the effect of the sound across appropriately. Dialogue is clear and the surrounds are ever-present, usually to enhance the music which is a big part of the looming dread that hangs over the film. 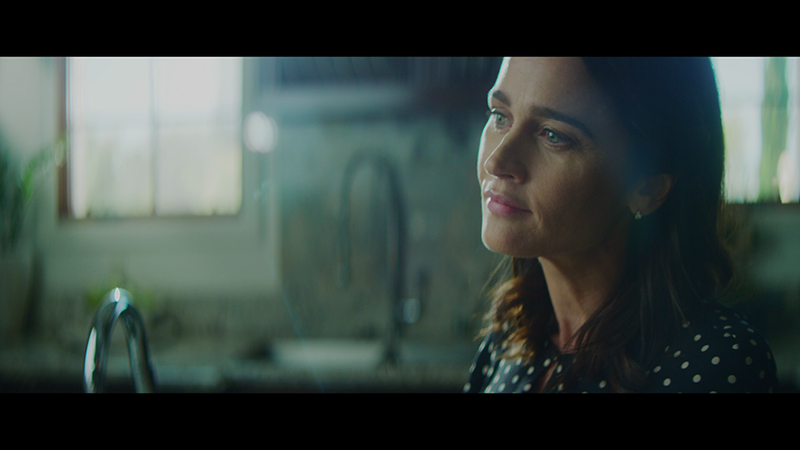 Sound effects, including some attempts to create some background elements to develop a mystery, are crisp and well-prioritized, making for a solid, supportive presentation for the film. Not a one. Would have been nice to hear from the director on how he pulled together this low-budget film. I will beat the drum for any film that does something I've never seen before, especially if that surprise is well-motivated, well-executed and entertaining. Monster Party delivers a moment that definitely fits the bill, and the rest of the film around it offers more than enough to stay tuned: it's unique, interesting and well-made, even if it lays most of its cards out pretty early. The Blu-ray arrives in solid shape, though there's not an extra to be had, which makes it less of a disc you should own than one you should want to check out.